A sleek, modern style exudes from the Genessy white marble table lamp. The subtle grey veining, accented with antique brass plated details add to this simple, yet eye-catching design. A rectangular white linen fabric shade completes this piece. Designed by Carolyn Kinder International. Available to trade professionals at Uttermost.com. 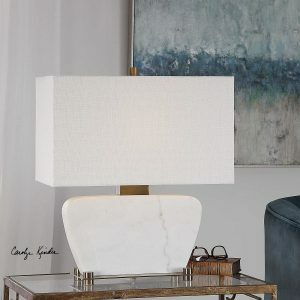 For retail purchase Google keywords “Carolyn Kinder Genessy Marble Table Lamp”.